Convenience! New! Affordable ! Now and Zen provides all this and much more! 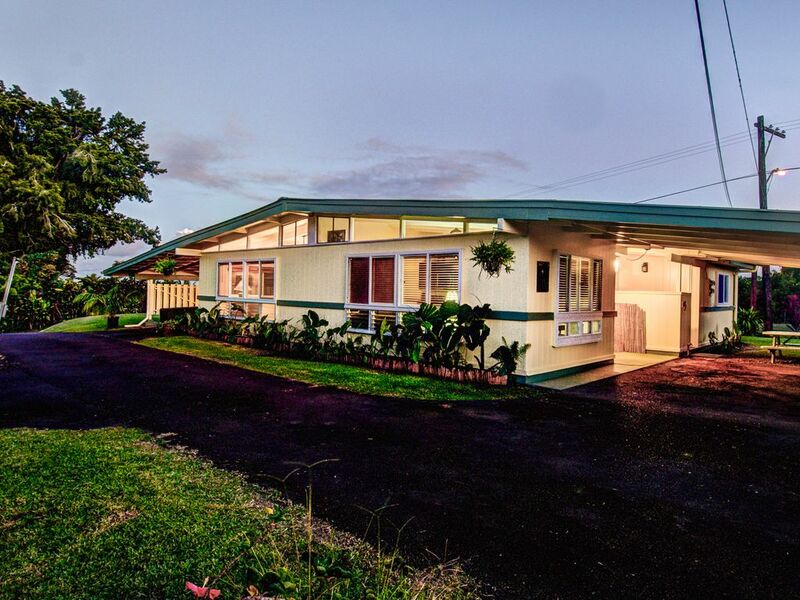 This 1960's Hawaiiana duplex has had a recent complete remodel from top to bottom in the fall of 2015. There is an Asian theme to the decor throughout this rental. The kitchen in Now and Zen boasts all new stainless steel appliances along with Quartz countertop. Everything is there you might need for meal preparation is there and if not , ask the owners and they might supply it. "Happy Coats" hanging in the closet to lounge in. The large bathroom has a dual sink vanity and a glass enclosed tiled shower. Relax in the Great Room watching from Direct TV channels on the 42 inch flat screen. Free Wi Fi is available as well. Ceiling fans are in the rooms and extra floor fans if needed are available for when the trade winds slow down. Our goal is to keep our guests happy and comfortable. We enjoy supplying knowledge about the area. Phil has left a copy of his book on Hawaiian history on the table for you to look at. A signed copy could also be purchased from him if you desire. There is one stair into the rentalr and we have refitted in the remodel to accommodate standard size wheelchairs. In the open ended carport there is a picnic table for outdoor dining options. This looks out on the fruit orchard. When the clouds part there are also dramatic views of Mauna Kea. Recently a gas BBQ has been added. It is in a covered area in the back of the lot beneath the avocado tree. avocados, mangosteens, bananas, lilikoi, just to name a few. You are free to pick what is in season. Just ask the owner which is ready. There is so much to do and see in Hilo and nearby areas that a few days can only make a small dent in it. Enjoy walking to many Hilo attractions including art galleries, numerous restaurants and taverns, and Hilo's famous Farmers Market within 1/2 a mile. The Lyman Museum, Tsunami Museum and Imiloa Astronomy Center, and the University of Hawaii Hilo campus are all within 2 miles. A stroll along Kamehameha Avenue on Hilo's Bayfront will give you a real feel for the Hawaii of old with a relaxed pace and a feeling of Aloha that will want you to schedule another trip to Hilo. You won't be disappointed in Hilo or Now and Zen. There are big hearts in the friendly folks here with LOTS of Aloha. My husband Phil and are are active travelers and have spent extensive time on all continents other than Antarctica. We tend to take trips of at least one month so that we can settle in to the area that we are visiting. We often stay in vacation rentals which has given us a special appreciation for this business model. We live on an adjoining lot so will be able to help you with any of your needs. Location! Location! Quiet and peaceful. Seems like you are in the country but you are actually in downtown Hilo with an acre of property . Fruit tress are accessible to picking when in season. One full bath with custom tile shower and a two sink vanity. We are surrounded by farmland yet are very close to downtown. Full size refrigerator with bottom freezer. Now and zen is one of four similar two bedroom "duplex" apartments on a pretty and quiet lot near downtown Hilo. My colleague and I have stayed in several of the apartments and found them to be very comfortable, functional and nice. We really enjoyed the tropical area. I asked Diane if we can come early to check in and she allowed us to do so. I love their area and fruits around. We made a right choice to check out from hilton hotel to stay at Now & Zen. We thoroughly enjoyed staying at Now and Zen. It was on a quiet road, not too much traffic, walking distance to town. Comfortable, nice for 2 couples. It is a wonderful property with a beautiful kitchen/bathroom/bedroom and living areas. Has lots of space and is well maintained. Definitely our new favorite in Hilo! We were lucky and happy to find “Now & Zen” — convenient, comfortable, spacious, quiet , clean, with everything we needed for a week-long stay. Nightly coqui frogs’ rhythmic calls put us in sleep quickly and stopped within a couple hours or so. The owners, Diane and Phil, were very informative, knowledgeable, and helpful. Ask them any questions, you’ll always get answers. There are recycling and composting bins for each unit. The house and property are very, very nice. The house is very nicely updated, but loved the character of the cottage with the high wood beam ceilings. It had everything we needed and was close to town. I understand why homes do not have air conditioning, but it was hot and humid, so we found it difficult to sleep. Now and Zen is located near the Wailuku River next to Reed's Island, in 5 minutes of walking you can be in downtown bay front. The next door unit is the newly remodeled sister unit Bamboo Hideaway.. On two sides of the property is agricultural land. Quiet and peaceful.